Jupiter is the light when all others go out. Your Jupiter shows the way to prosperity, growth, and all things epic. If Jupiter rules your chart (as your ascendant) or your Sun, you were born under the lucky star. Jupiter's sign is Sagittarius, the sign of optimism, faith, and prospering from risks others wouldn't dare take. 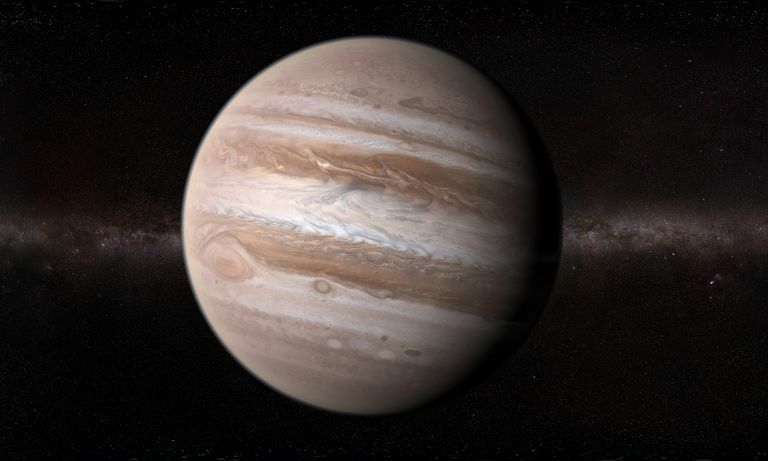 Jupiter's transit to a planet shows the forces of growth in play. The House shows the life sphere where it's likely to play out. Your Jupiter sign guides your path through life. Show Jupiter some love, and you're more apt to see a return, maybe an epic one. Under the influence of Jupiter, you are likely to do everything on a grand scale. Of course, that has its drawbacks, too, in the form of overindulgence. Shadow traits include laziness, the inability to focus your energies, overconfidence, and grandstanding. According to the Ancient Greeks, planets were believed to have positive and negative influences on the lives of humans. Some planets were "benefic," literally meaning good-doing, and some were "malefic," or bad-doing. Jupiter was known as the Greater Benefic, guiding humans to high ideals, a sense of purpose, and, ultimately, happiness. Jupiter determines whether your life journey will be smooth or rocky, whether you'll be stingy or generous, and whether you will be primarily optimistic or pessimistic. Look for the symbol for Jupiter on your birth chart. Jupiter falls in one of the twelve signs of the Zodiac, from Aries to Pisces. Jupiter stays in each sign for one year, and you'll enjoy a Jupiter return every 12 years. When transiting Jupiter makes a favorable aspect to your Jupiter or another planet in the chart, this paves the way for good fortune. And it's magnified if you've been working hard and using your natural talents. For example, if transiting Jupiter conjuncts (aligns with) your natal Jupiter, you might get a financial windfall, a new job, a promotion, etc. However, like with any astrological lucky break, you may not be able to just kick back and wait for the shower of blessings. You've got to take advantage of the opportunities that come your way. Jupiter's gift is to guide you to your highest fulfillment and happiness. As the planet of growth, it will take you down the paths of learning, travel, positive challenges, and philosophical inquiry. Jupiter in your chart drops clues about where and how to take leaps of faith. It shows the sphere of life (house) and the likely method (sign) by which you'll make those giant leaps. Jupiter in the elements shows the medium you work best in fire, earth, air, or water. Jupiter is said to influence all the good and noble things of life, and lead each of us toward a higher purpose. Jupiter rules Sagittarius, the sign of truth-seeking, learning, travel, philosophy, and physical movement. For the non-Archers, Jupiter in the birth chart shines a light on an individual's spiritual quest. It points toward the arena where optimism and faith can be stirred up since it generates a sense of the hero's journey—life as a grand adventure. There's a lot of talk in new age circles about "creating abundance" and being in the flow of prosperity. Jupiter in the birth chart points to where you'll find rewards through risk-taking and growth. And that can mean more money, but also a sense that your life is evolving toward something meaningful. The planet Jupiter casts out more heat than it takes in from the Sun, which is symbolic of an inspired person with a self-generated internal heat source. Jupiter's influence also helps you fan the flames of your passions so you can fulfill your destiny. It encourages curiosity and openness that comes from the wisdom that engaging in life makes your world ever larger. In other words, Jupiter's resonance in the chart shows how you take in new ideas, cultures, and people, and allow them to add color and dimension to your life. Your Jupiter Sign and Its Quality—Cardinal, Fixed, or Mutable? The Jupiter Return - Your Luckiest Year? The Ninth House - What's the Meaning? What are the Houses in Astrology? What's Pluto's Meaning in Astrology?